from Bodleian Alexander manuscript (MS Bodl. 264) Although the image shows Diana on horseback in pursuit of Acteon, it too represents my frenzied chase. My quarry is not animal, rather words and their etymologies and the beautiful and bizarre marginalia images from illuminated manuscripts. While I have not blown a hunting horn, it is true that with each discovery, I have, like a mad woman, stopped all and sundry to show them images or regale them with the etymologies we have found behind the words making up ‘company terms’. It all began with a student spotting a copy of An Exaltation of Larks by James Lipton on my table, a book of “company terms”, lists of the terms of venery. 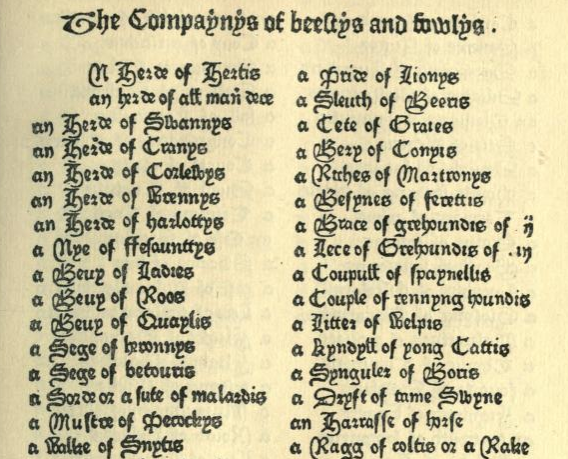 Today this may appear to be esoteric knowledge, yet it was essential knowledge for young nobles in the etiquette of hunting- how to refer to the “companynys of beestys and fowlys”. What began as a romp in whimsy in much the same manner as Snools, Snickersnees and Defenestration: What a Kerfuffle, has taken on a life of its own becoming a serious inquiry into the words that form collective nouns. The individual words making up these poetic terms, as all words do, have compelling stories to tell. So let the pursuit, the great hunt begin! Track down the roots of the terms of venery, nouns of multitude, company terms otherwise known by the rather dull appellation “collective nouns” – a term that belies their playfulness and imagery! Tally-ho! A sampling of the delights to be found in the Boke of St Alban’s, 1486. The Boke of St Albans as well as listing company terms, also listed birds suitable for the various social ranks. I love the line ‘A kestrel for a knave’. I can’t help wondering about the idea that young adolescent boys, and girls for that matter, should care for a kestrel. Finally, I understand the allusion in the title of Barry Hines’ classic text, A Kestrel for a Knave. Students in the process of discovering the exact term of venery, created their own collective nouns for various animals and birds. There has been a lot of enthusiasm and laughter over these inventions. It invites word -play: ‘ a roar of leopards, a caw of crows, a purr of kittens, a startle of starlings and a tusk of boars’, just some of the several terms concocted by my students. See how we went about this inquiry here. Chaucer when warning against envy in the in the Parson’s Tale uses the word <murmuration> ‘After bakbitynge cometh grucchynge or murmuracioun..’ (499) in modern English: After backbiting comes grutching or murmurance [grumbling & complaining]. From this source we know the word has been attested in English as far back as 1390. We see in the OED it was used in reference to starlings in 1450:’ in PMLA (1936) 51 603 (MED) ‘A murmuracione of stares’. We analyzed this as <murmur+ate+ion> and as Jin noted above, the base element entered English via Old French meaning ‘sound of human voices, trouble or argument’ from Latin murmurare which has origins in a reduplicated PIE root*mor-mor meaning hum, muttering rushing. Jin commented on the Greek cognate mormyrien : meaning to boil. When you look at the murmuration clip below you can hear the rushing and see the ‘boiling’ hum of starlings. In Old English <starling> was stærlinc with the diminutive suffix <-linc> added to the base “stær” (Online Etymology Dictionary). In 1486 in the Boke of St Albans f vi b, we come across ‘A Murmuracion of stares’. The origins of stares goes back to PIE *storo- which has also led to the Latin etymon : sturnus. The common starling is known by its scientific name sturnus vulgaris labelled as such by Linnaeus in his Systema Naturae in 1758. The Old English staer, or the Latin sturnus dates back to the second millennium BC. ‘”Starling” was first recorded in the 11th century, when it referred to the juvenile of the species, but by the 16th century it had already largely supplanted “stare” to refer to birds of all ages’ (Common Starling, Wikipedia). Once called stares < stare+s>, analyzable in Old English, we today can not account for the missing <e> in <starling> so concluded in present day English, <starling> is a free base element. ‘Rout’ entered English in the 13th century initially meaning a group of soldiers or mob. Online Etymology Dictionary states: ‘The archaic English noun rout “group of persons, assemblage,” from rute, Old French route “host, troop, crowd,” from Vulgar Latin rupta, “a dispersed group,” here with sense of “a division, a detachment.”The word derives from the Latin rupta (feminine), which is from the infinitive form of the verb rumpere meaning to break. From this root we found three base elements: <rupt> which gives us eruption, corruptible interrupt, disrupt, rupture ; <route>, the free base element from which routine derives and <rout> another free base element. We found that although Lipton had recorded the collective term for wolves as a ‘route of wolves’ with the final <e>, the OED separates the meaning of <rout> and <route>. The OED denotation states <rout> in sense 1b as :’ A number of animals grouped together; a pack, flock, herd, etc. ; spec.a pack of wild animals, esp. wolves.’ and cites evidence of this from as early as 1300 : ‘c1300 (▸?a1200) Laȝamon Brut (Otho) 1 the 300 ‘Þar he balu funde vppen one route of wolues awedde.‘ Online Etymology Dictionary notes that <rout> appeared first in the 13th century in the sense of a group of soldiers and also as a gang or mob. While the OED lists the word as <rout>, the older spelling was <route>. Today <route> is mostly associated with the meaning of a ‘way or course’. We discovered, when looking at the OED, that there had been twenty different meanings associated with <rout> , many now archaic with meanings ranging from a workaday horse, a sound of roaring, the sound snoring to the defeat of an enemy! Many of these senses contained the idea of disruption in terms of rowdiness or noise. Even the more respectable sense 8 of <rout> as a fashionable gathering, popular in the 18th and early 19th centuries contains an idea of noisy revelry. At such gatherings ‘rout-cake’ would be served, a rich type of cake: ‘He managed a couple of plates full of strawberries and cream, and twenty-four little rout cakes.’ (Thackery, Vanity Fair). <Route> too appeared in the 1300s closer to the sense that we know of it today, as a way or course. It came via Old French rute from the Latin phrase rupta via – a road opened by force. The sense of the customary path of animals occurred in the 15th century and the sense of a fixed regular course or direction is attested from 1792. Today we use the the homophone principle to signal meaning difference between <rout> and <route> for different senses, but both from the same ‘root’. A different spelling and pronunciation, at least in British and Australian pronunciation: /ruːt/ for <route> and /raʊt/ for <rout>. The OED comments on the pronunciation difference ‘The pronunciation with a diphthong is recorded from the second half of the 18th cent. and preferred by some, but not all commentators at that time; it disappears from standard British English in the course of the 19th cent., but is still widespread in North America.’). Read about the different meaning of <route> as ‘a way or course’ here. <Wolf>, Old English wulf from Proto Germanic roots *wolfaz from PIE root*wlkwo- and its Latin cognate lupus and Greek lykos, reveal in the words derived from these etymons, a fascinating story of man’s ambivalent attitude to this creature throughout time. You can do no better than to read Douglas Harper’s fascinating account here,Wolf and Werewolf. Be amazed by the links connecting werewolf, Beowulf, Zeus and even the Louvre– all stories that emerge from this ancient root and man’s fascination and fear of this creature. Inquiry into the words <rout> and <wolf>, offer an opportunity to discuss the digraph <ou> and the letters <o> and <u> and their conventions. (For information on the letters <o> and <u> go Real Spelling Tool Kit 2 4C: Letters <o> and <u>: conventions that concern them. We found it interesting to discover how few words occurred in English occurred where the grapheme <w> was followed by a <u> as compared to the number followed by the grapheme <o>. Go to Real Spelling theme 2H The Letters <w> and <x> their place in English orthography. The etymology of the words comprising the company term ‘a tiding of magpies’ is fascinating. Students discovered the word <tiding> is made up of two morphemes, the free base element ,<tide> and the vowel suffix <-ing>. 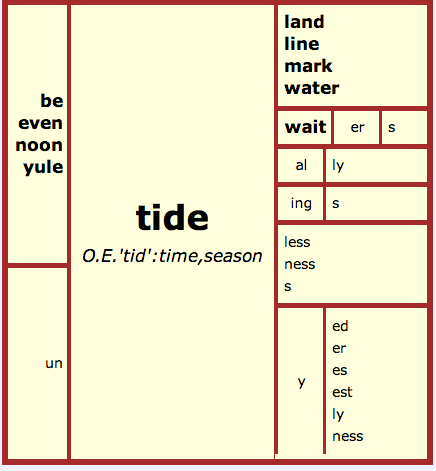 The present day free base element <tide> is from Old English ‘tid’ meaning time, season, a period of time. This Old English etymon came from a Proto-Germanic root *tidiz which has led to cognates in other languages carrying the sense of time such as German zeit which derived from the Proto Indo European root *di-ti . This root has a sense of division, so that <tide> according to Ayto denotes ‘time, cut up, a portion of time’. We see this element in words like Yuletide, noontide, eventide. By the 14th century the word ‘tide’ became linked with the sea and the time of its its ebbing and rising. Apparently in Old English there was no word for this phenomena other than ‘ebba’ and ‘flod’. Surprisingly <tidy> is also derived from this root. In the 13th century this carried a meaning of ‘in good condition or healthy’ , originally, as Online Etymology states: ‘in season, opportune, excellent’ and we see then the time connection obscured somewhat as the word shifts in meaning to ‘orderly in habit and neatness’ from 1706. Take a look the matrix below to discover words sharing the <tide> base element. In building words from this base, students reinforce their understanding of the function of a single non-sylabic <e>, the effect of a vowel suffix on a word, the <i> <y> relationship. An important question for students of all ages to research is: under what circumstances does the <y> change to an <i>? Gather evidence and develop a hypothesis. (To develop your knowledge see Real Spelling: Kit 1 A The <i> <y> relationship Part 1 and Kit 3F: The <i> <y> relationship Part 2) This matrix below shows words we discovered sharing the base element <tide>. The nursery rhyme above, from Britain in the 1780s, is about magpies. Magpies have often been linked with misfortune especially a single magpie so various superstitious rituals evolved to deal with this such as raising one’s hat or bowing to the bird or making the sign of the cross. Peter Tate in his entertaining book Flights of Fancy describes how in some parts of England people would cross their feet or spit in the direction of the bird to ward off bad luck. Yet in Sussex it was good luck for a magpie to alight on the roof of a house. The word <magpie> has an intriguing etymology. In the 13th century the bird was known as a <pie>which has it roots in the Latin etymon pica meaning ‘pointed’ in reference to its beak. The female name Margret became attached to the bird as nickname in reference to its chattering, and when associated with the nickname Mag especially the notion of idle chattering. Ayto discusses how some etymologists have linked the <pie> base element in <magpie> to the edible <pie> in reference to the bird’s tendency to accumulate treasure hence the comparison to the miscellaneous items within the medieval pie ! The word <pied>, attested in English from the 14th century, means two coloured like the black and white plumage of the magpie. The compound word piebald <pie+bald> too links to the magpie. So a tiding of magpies, is the news or tidings the magpie brings in its song but perhaps also a foreshadowing of the future, based on the numbers of the birds you see! The word <cat> has been around in English since 700 as Old English catt from a Proto Germanic root *kattuz which was from the Late Latin the word catta– cattus or prior to this in Latin the animal was feles which led to the word we recognize today as feline. The word <cat> however is older than Latin and may be Afro-Asiatic in origin. However, the Latin word has led to cognates in many languages such as French chat, Italian gatto and Spanish gato. For a more detailed account look on Online Etymology Dictionary. The word catty meaning spiteful and devious is obviously built on the free base <cat> with the vowel suffix <-y> and is attested from 1886. And while referring to the purr and paw of cats, what about kittens? <Kindle> is fascinating in its etymological associations. Kindle in terms of starting a fire is perhaps of Scandinavian origins. Not the same as <kindle> as used in the venery term here which comes from a vast family springing from a Germanic root:*kunjam leading to *gakundiz: family, race from an older Proto Indo European root *gen- *gon-, *gn- all suggesting produce. The Latinate derivatives have led to words such as generate, general, gender. The Greek branch has produced gene and genetics, gonorrhoea. However, it’s the Germanic branch which passed into Old English as gecynde: birth, origin, nature or race. In the Middle English period as the prefix disappeared the word became ‘kindel’ to give birth or as a noun the offspring or young of an animal. In the Boke of St. Albans F vj, we read, “ A litter of welpis, a kyndyll of yong Cattis.” A kindle is a therefore a brood, a litter or the young of any animal. This Old English etymon has led to kin, kind, king! Kitten as you would expect means young cat and is related to cat not just physically but etymologically also. The word is attested from the 14th century via Anglo-French variant of an Old French etymon chitoun from chat from Late latin cattus! Ask students to examine the phonology of the grapheme <c>. Under what circumstances does it represent /k/? When does it represent /s/? Search for words where both /k/ and /s/ are represented. Develop your hypothesis as to when <c> represents /k/. If a <kitten> is a young <cat> then why not *citten? <le> forms nouns which in Middle English period were often written as <el>. Often these were tools: nozzle, handle.This often has a diminuitive sense. We found syllabic <le> in words that are adjectives- words that are apt to do something such as brittle, fickle. In many of these words <le> is not a suffix, perhaps once it was but is often no longer so in English..yet <kind>, <kin> and <kindle>.. a kindle of kittens. 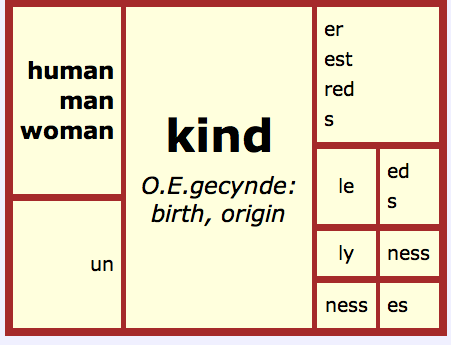 Obviously these words are etymologically related but can kindle be analyzed as <kind+le>? The matrix below represents our thoughts so far, you’ll notice our daring assertion that <-le> here in kindle is a suffix. As you read the matrix no doubt you wonder about one final term apparent in the matrice above. Raven from Old English hræfn from Proto Germanic *khrabanas from PIE ker- supposedly imitative of the sound the bird makes.The raven was the symbol on the Viking standard, the symbol of Odin. Odin’s two ravens Hugin ( thought) and Munin ( memory) perched on Odin’s shoulder at the end of their daily flight around the world to tell Odin what they had seen. The Quaran links the raven with Cain’s murder of Abel. Yet not all tales are negative of the raven. Tate indicates that they can augur both favorable and unfavorable outcomes. A raven seen at the beginning of important activities bodes well and in 17th century Ireland to see a raven with white on the wing flying on the right side was extremely fortunate. However, if a raven croaks three times a death will follow or if ravens forsake the tower of London, Britain’s downfall is inevitable! Read Online Etymology Dictionary for the poetic quote from E.A. Armstrong and a more extensive explanation. This raven ,the bird, is is different etymologically from the adjectival, ravening which comes from an archaic verb meaning to prey and plunder. I will forever associate ravens with Peter Cook. Watch the absurdity of Peter Cook interviewed as Sir Arthur Streeb Greebling explaining his life’s work of teaching ravens to fly underwater! The sheer exuberance and playfulness of these company terms has led to much hilarity and a lot of rushing up to me with ‘Did you know that the etymology of …?” Music to this word nerd’s ears! Below find a glimpse of the terms we’ve investigated so far! More explanations from these inquiries to come! So ‘jolly good’, that’s it so far for these company terms so much more one could say, so many more inquiries to be made!